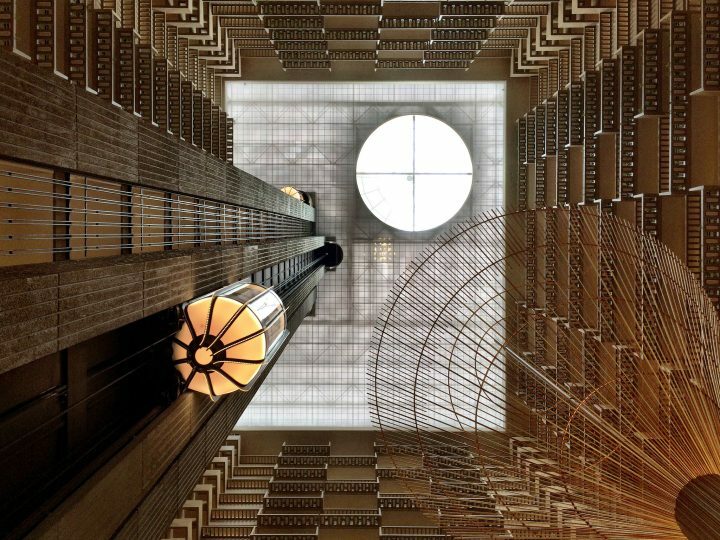 With their enormous atria, elaborate fountains, and glass elevators, John Portman’s hotels are straight out of a science fiction movie. Although you may not recognize his name, you’ve certainly seen John Portman’s buildings — if not in his hometown of Atlanta, then perhaps in San Francisco or Shanghai, or even in a science-fiction movie. Portman, who died on December 29 at the age of 93, is best known for his hotel designs, which often featured enormous atria with elaborate fountains on the ground, balconies and restaurants overlooking them from dozens of floors up, and glass elevators crawling up the inside — design aspects that made his creations especially suitable as filming locations for movies like True Lies in 1994 and, more recently, Insurgent. The symphonic architecture continued with the Hyatt Regency San Francisco (1973), Los Angeles’s Westin Bonaventure Hotel (1976), and New York Marriott Marquis (1985) in the US, and with the likes of the Regent Singapore (1982) and Westin Warsaw Hotel (2003) abroad. In Atlanta, Portman almost single-handedly created the downtown aesthetic. He was known as a rare (and controversial) combination of architect and developer, and his Peachtree Center complex, which spans 14 city blocks and includes the Hyatt Regency, Westin Peachtree Plaza, Marriott Marquis, AmericasMart, and SunTrust Plaza, was added to the Georgia Register of Historic Places in October. Building large, luxurious buildings in cities where the downtown areas were still rather dicey in the 1970s and 1980s, Portman was seen as providing a respite from hectic city life to his champions and as a proponent of early inner-city gentrification by his detractors. Born in his mother’s hometown of Walhalla, South Carolina, Portman grew up in Atlanta and lived there for most of his life. He graduated from the city’s Georgia Institute of Technology with a degree in architecture in 1950 and set up his own design firm there in 1956, where he worked up until the very end. A public service to remember John Portman takes place this Friday, January 5 at 12:30pm in the atrium of AmericasMart Building 3 at the corner of John Portman Boulevard (Historic Harris Street) and Ted Turner Drive (Historic Spring Street), in Atlanta.